I need to make myself a felted cloche, yes? — Writing… or Typing? You are here: Home / daily life / I need to make myself a felted cloche, yes? I need to make myself a felted cloche, yes? 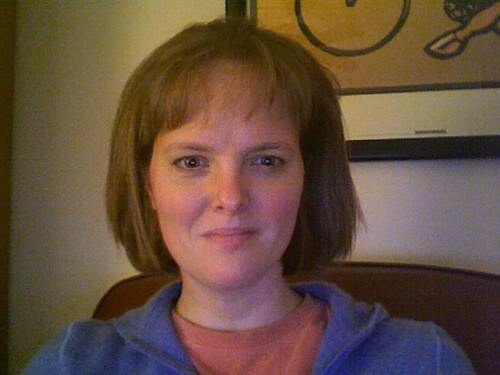 …to go with my new haircut? If I look wryly amused, it’s because John said, "It will be cute!" and I said, "When it grows out, or when you get used to it?" He’s a nice boy and a good husband, so you can probably guess the answer. Aw. It is cute! But would be even cuter with a felted cloche. Just because most things are. Robynns last blog post..I smell flannel! I’m with Robynn, I think it’s cute. I love the look on your face, too. (“Can you believe this s***?”) It will be cute with new hats, too. It looks great – definitely the shortest I’ve ever seen it. Guys are strange about hair. When I cut my waist-length hair to a bob my brother asked if I could put it back. And I have a mail coworker who, every time I would cut my hair short would tell me he liked it better longer. Then he commented on my lipstick one day, at which point I told him that his comments were inappropriate and needed to stop. Anyway, guys are weird about hair. I think your haircut looks great. Well, last time I cut it nearly this short, John’s response was, “Sassy!” so he’s pretty on board. What will you do with your ponytail holders?! I think it’s cute. Marilee J. Laymans last blog post..Happy Birthday mplsvala! I think it’s cute! But I need to make a felted hat a well, so we could make one together. AFTER the Christmas knitting -which is NOT done. Sigh. LOVE it! Looks very chic, and don’t let anyone tell you otherwise. Okay, here are your questions. The first four I’m giving to everybody who asked (#2 is stolen from the ones lass gave me, because I had fun thinking about the answer) and the last one is just for you!